Oven Roasted Radishes! - Our Sunday Cafe, the Retirement Edition! 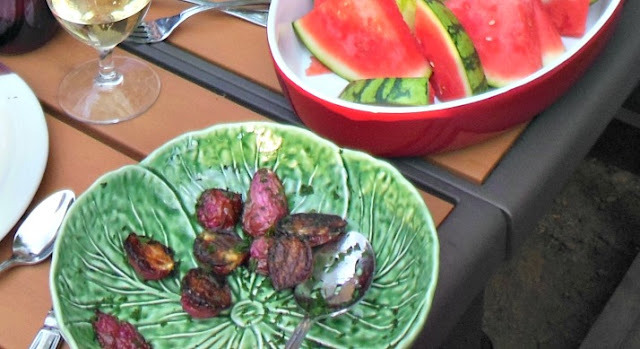 If someone had told me that I would love roasted radishes, I would have said, "are you kidding?" Actually, I have never and I do mean never been a fan of, the radish. They get hot or spicy with size and often overpower any salad or sandwich they are put into. But this is the second recipe I have made that has the cook, roast those little red guys. The first recipe was a roasted radish and carrot salad. It was wonderful! I plan on making that salad again. Vegetable salads, especially roasted vegetable salads are on my radar right now. In my traipse through Pinterest looking for radish recipes, I also came across this one for a simple roasted radish side dish. Not only delicious, it is easy and uses those large radishes that do have a bit of a bite to them. We shared dinner with friends last night and these were on the table. Everyone loved them and the preparation is very simple. Unfortunately, while I was fairly busy with the whole process of having friends over for dinner, I did not snap any photos of the preparation at part of the recipe, but it is simple and I know you can do! Trim radishes, and cut in half. In a large bowl, toss radish halves with 2 T olive oil. Place radish pieces cut side down on a large baking sheet. Sprinkle with salt and pepper, roast 10-12 minutes until a golden brown and a slight crunch remains. Roast 16-20 minutes for a deeper brown flavor and softer interior. Once dinner was done, and the clean up almost completed, it started to rain. Summer evenings will keep you guessing.